The cytokine-mediated suppression of hepatic drug-metabolizing enzymes by inflammatory disease and the relief of this suppression by successful disease treatment have recently become an issue in the development of drug interaction labels for new biological products. 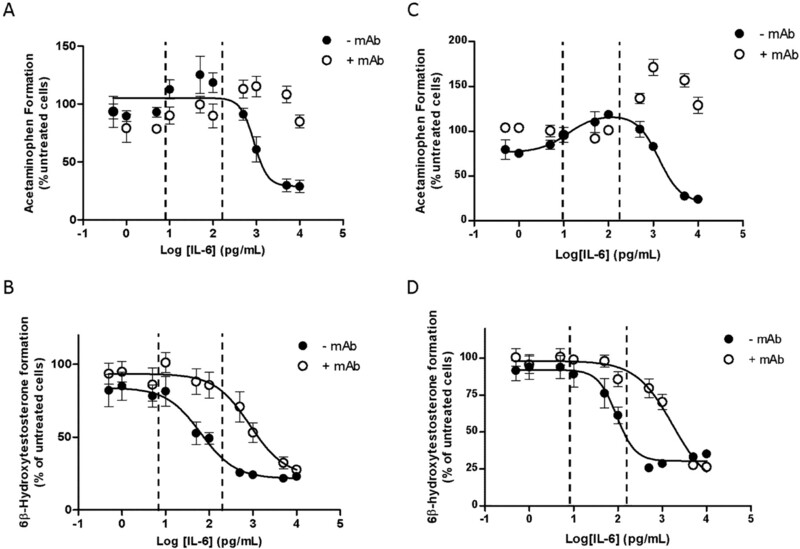 This study examined the effects of the inflammatory cytokine interleukin-6 (IL-6) on drug-metabolizing enzymes in human hepatocyte culture and the abrogation of these effects by a monoclonal antibody directed against IL-6. Treatment of human hepatocytes with IL-6 (n = 9 donors) revealed pan-suppression of mRNA of 10 major cytochrome P450 isoenzymes, but with EC50 values that differed by isoenzyme. Some EC50 values were above the range of clinically relevant serum concentrations of IL-6. Marker activities for CYP1A2 and CYP3A4 enzyme were similarly suppressed by IL-6 in both freshly isolated and cryopreserved hepatocytes. IL-6 suppressed induction of CYP1A2 enzyme activity by omeprazole and CYP3A4 enzyme activity by rifampicin but only at supraphysiological concentrations of IL-6. Glycosylated and nonglycosylated IL-6 did not significantly differ in their ability to suppress CYP1A2 and CYP3A4 enzyme activity. A monoclonal antibody directed against IL-6 abolished or partially blocked IL-6-mediated suppression of CYP1A2 and CYP3A4 enzyme activity, respectively. These data indicate that experimentation with IL-6 and anti-IL-6 monoclonal antibodies in human hepatocyte primary culture can quantitatively measure cytochrome P450 suppression and desuppression and determine EC50 values for IL-6 against individual cytochrome P450 isoenzymes. However, the complex biology of inflammatory disease may not allow for quantitative in vitro-in vivo extrapolation of these simple in vitro data. The cytokine-mediated suppression of hepatic drug-metabolizing enzymes by inflammatory disease and the relief of suppression (“desuppression”) by successful disease treatment have recently become an issue in the development of drug interaction labels for new biological products (Huang et al., 2010). In a bellwether example, treatment of patients with rheumatoid arthritis with the anti-IL-6R monoclonal antibody, tocilizumab (Actemra, Genentech, South San Francisco, CA), resulted in a 1.8-fold (57% of control) decrease in the plasma area under the curve of the CYP3A4 substrate simvastatin (Genentech, 2010). Along with some related in vitro characterization of IL-6 effects in human hepatocytes, this resulted in a drug interaction label that recommends caution for tocilizumab use with narrow therapeutic index cytochrome P450 (P450) substrates (Genentech, 2010). This is a drug-disease interaction, in which the perceived risk of successful disease treatment is therapeutic failure because of an increase in the clearance of cytochrome P450 substrates. Subsequently, regulatory authorities have requested in vitro and/or in vivo study data for other cytokine-modulating biological agents such as golimumab ([CDER (Center for Drug Evaluation and Research) 2009, http://www.accessdata.fda.gov/drugsatfda_docs/nda/2009/125289s000_SumR.pdf]). Unfortunately, there is only a limited understanding of the potential utility of the preclinical tools that might be used to predict the occurrence and magnitude of clinical desuppression of cytochrome P450 enzymes by anticytokine biological agents. Interleukin-6 (IL-6) is an important mediator in the acute-phase response (APR) (Morrone et al., 1988; Andus et al., 1989) and is relevant to the treatment of chronic diseases such as rheumatoid arthritis, as shown by the approval of tocilizumab (Rose-John et al., 2007). IL-6 is secreted by Kupffer cells in the liver and acts through its receptor, IL-6R (CD126), on hepatocytes to elicit a variety of effects including mediating components of the APR, hepatic regeneration, and antiapoptotic and antinecrosis effects (Taub, 2004). The IL-6R can bind IL-6 as a soluble or as a membrane-bound protein (Rose-John et al., 2007) and the IL-6/IL-6R complex must bind two monomers of gp130 membrane protein to elicit signal transduction (Rose-John et al., 2007; Waetzig et al., 2010). Hepatic cytochrome P450 enzymes are known to be down-regulated during infection and inflammatory stress, and this occurs across the spectrum of cytochrome P450 isoenzymes (Shedlofsky et al., 1994; Morgan et al., 1998; Cheng et al., 2003). Cytochrome P450 down-regulation is attributed to cytokine release, because various cytokines mimic the effects of infection when injected in vivo or added to hepatocytes in primary culture (Renton and Nicholson, 2000; Morgan, 2001; Aitken and Morgan, 2007). The mechanism of cytochrome P450 pan-suppression is apparently transcriptional, is related to the APR, and may involve NF-κB, although a unifying mechanism for pan-suppression has not been fully elucidated. Ghose et al. (2004) have proposed that the broad down-regulation of cytochrome P450 isoenzymes may be due to inflammation-induced alteration of the subcellular location of retinoid X receptor-α, which is an obligate partner in the heterodimeric nuclear receptors liver X receptor, farnesoid X receptor, retinoid acid receptor, CAR, PXR, and peroxisome proliferator-activated receptor-α. These nuclear receptors regulate enzymes controlling the metabolism of lipids, bile acids, steroids, and xenobiotics. Human hepatocytes have been used to investigate the effects of cytokines involved in the acute-phase response on cytochrome P450 regulation (Sunman et al., 2004; Aitken and Morgan, 2007). 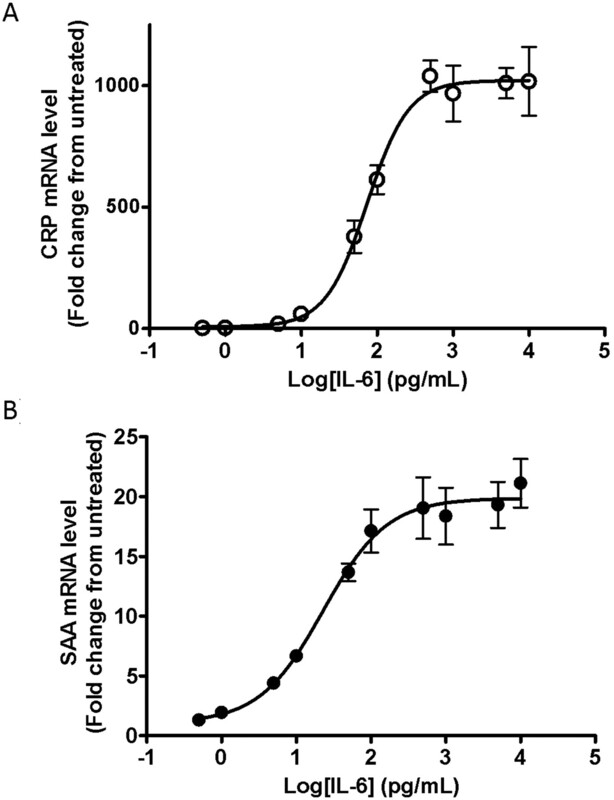 IL-6, bacterial lipopolysaccharide, tumor necrosis factor-α, interferon-γ and transforming growth factor-β all caused a marked decrease in cytochrome P450 mRNA and activity levels for CYP3A4, CYP2C isoforms, and CYP2B6, albeit with different magnitudes of suppression. Studies conducted to date were done at supraphysiological concentrations of IL-6 (>2000 pg/ml). In healthy individuals, serum IL-6 concentrations range from 1.3 to 10.3 pg/ml and are increased to 2.6 to 123 pg/ml in some patient populations presenting with inflammation-based diseases (Roytblat et al., 2000; Hidaka et al., 2001; Yilmaz et al., 2001; Arican et al., 2005; Mastroianni et al., 2005; Ataseven et al., 2006; Wang et al., 2008). To discern the strengths and limitations of in vitro experimentation on cytokine-mediated suppression of cytochromes P450, this study assessed the cytochrome P450 expression concentration response to IL-6 in primary human hepatocytes at physiologically relevant concentrations, the influence of interindividual variability across donors, the effects of cryopreservation, concomitant induction, reagent glycosylation, and the abrogation of IL-6-mediated suppression by a monoclonal antibody against IL-6. This study shows that inclusion of IL-6 and an anti-IL-6 monoclonal antibody in human hepatocyte primary culture allows quantitative measurement of cytochrome P450 suppression and desuppression. However, these data represent only a small component of the complicated biology of the acute-phase response and chronic inflammation in the intact liver, thus limiting the value of the model for quantitative prediction of clinical drug-disease interactions related to cytochrome P450 suppression and desuppression. Williams' E medium, Dulbecco's modified Eagle's medium, dexamethasone, phenacetin, acetaminophen, 6β-hydroxytestosterone, omeprazole, rifampicin, and HEK293-expressed IL-6 were purchased from Sigma-Aldrich (St. Louis, MO). Testosterone was purchased from Steraloids (Newport, RI). Human hepatocytes, cryopreserved recovery medium, and media supplements were purchased from CellzDirect (Durham, NC). Matrigel was purchased from BD Biosciences (San Jose, CA) and Krebs-Henseleit buffer (KHB) from Celsis/In Vitro Technologies (Chicago, IL). Human Escherichia coli-expressed IL-6 and human IL-6 neutralizing antibody (clone 1936) were purchased from R&D Systems (Minneapolis, MN). Nuclease-free water, RNAlater, a MagMAX-96 RNA isolation kit, a High-Capacity cDNA Transcription Kit, TaqMan primer and probe sets, and all TaqMan reagents and consumables were purchased from Applied Biosystems (Foster City, CA). IL-6R protein and mouse monoclonal and goat polyclonal antibodies to human IL-6 used in kinetic exclusion assay experiments were purchased from Abcam (Cambridge, MA). Cy5-labeled goat anti-mouse IgG was purchased from Jackson ImmunoResearch Laboratories, Inc. (West Grove, PA) and NHS-activated Sepharose from GE Healthcare (Little Chalfont, Buckinghamshire, UK). Suspension hepatocytes from the vendor were spun at 100g for 10 min and resuspended in plating media (Williams' E medium plus plating supplements: 5% fetal bovine serum, 100 nM dexamethasone, 100 U/ml penicillin and streptomycin, 4 μg/ml insulin, 2 mM GlutaMAX, and 15 mM HEPES, pH 7.4). Cryopreserved hepatocytes were thawed at 37°C, spun at 100g in cryopreserved recovery medium, and resuspended in plating media. Viability and density were measured by trypan blue exclusion and 52,000 cells/well were plated onto 96-well collagen I-coated plates. Hepatocytes were allowed to attach for 4 to 6 h, and plating media was removed and replaced with maintenance media (Dulbecco's modified Eagle's medium plus maintenance supplements: 100 U/ml penicillin and streptomycin, 6.25 μg/ml insulin, 6.25 μg/ml transferrin, 6.25 ng/ml selenious acid, 1.25 mg/ml bovine serum albumin, 5.35 μg/ml linoleic acid, 2 mM GlutaMAX, and 15 mM HEPES, pH 7.4) containing 0.25 mg/ml Matrigel. Cells were treated the following day. Media plus appropriate concentrations of cytokine and/or chemical drug was replaced daily. Unless otherwise noted, E. coli-expressed IL-6 was used for all studies. The LC-MS/MS system comprised a 4000 Q-Trap equipped with an electrospray ionization source (Applied Biosystems, Foster City, CA) coupled to an high-performance liquid chromatography system consisting of two LC-20AD pumps with an in-line CBM-20A controller and DGU-20A5 solvent degasser (Shimadzu, Columbia, MD) and a Leap CTC HTS PAL autosampler equipped with a dual-solvent self-washing system (CTC Analytics, Carrboro, NC). The injection volume was 20 μl for each analyte. LC separation was achieved using a Gemini C18 2.0 × 30 mm 5-μm column (Phenomenex, Torrance, CA). Gradient elution (flow rate = 500 μl/min) was performed using a mobile phase system consisting of (A) 5 mM ammonium formate with 0.1% formic acid and (B) acetonitrile with 0.1% formic acid with the following gradient: 0 to 0.5 min, 5% B; 0.5 to 1.75 min, 100% B; and 1.75 to 2 min, 5% B. Source and gas parameters were as follows: curtain gas, 10; collision gas, medium; ionspray voltage, 4500 V; and temperature, 450°C. Cells were washed with 100 μl of KHB for 5 min. After removal, 100 μl of KHB containing 100 μM phenacetin was added to the cells and incubated on a rocking platform for 15 min in a 37°C incubator with 5% CO2. After the incubation period, 50 μl was removed and added to 50 μl of acetonitrile containing 100 nM tolbutamide (internal standard). Acetaminophen was measured by using multiple reaction monitoring with the following conditions: Q1, 151.9; Q3, 110; DP, 56; CE, 25; CXP, 20; mode, positive for acetaminophen and Q1, 271.2; Q3, 91.1; DP, 71, CE, 43; CXP, 20; mode, positive for tolbutamide. Cells were washed with 100 μl of KHB for 5 min. After removal, 100 μl of KHB containing 150 μM testosterone was added to the cells and incubated on a rocking platform for 15 min in a 37°C incubator with 5% CO2. After the incubation period, 50 μl was removed and added to acetonitrile containing 100 nM tolbutamide (internal standard). 6β-Hydroxytestosterone was measured by using multiple reaction monitoring with the following conditions: Q1, 305; Q3, 269; DP, 55; CE, 25; CXP, 13; mode, positive. Immediately after activity assays, the remaining KHB was removed, 100 μl of RNAlater was applied, and the cells were frozen at −30°C until mRNA isolation (no longer than 1 week). Total RNA was isolated using the MagMAX-96 RNA isolation kit according to the manufacturer's protocol, and RNA quantity and quality were assessed using the Agilent RNA 6000 Nano Chip kit and/or NanoDrop (Agilent Technologies, Santa Clara, CA). All RNA samples were then normalized to 5 ng/μl with nuclease-free water. cDNA was synthesized using a High Capacity cDNA Reverse Transcription kit with a final volume of 40 μl and 132 ng of total RNA according to the manufacturer's protocol. After synthesis, the cDNA reactions were diluted to 160-μl total volume with nuclease-free water. TaqMan reactions were run on a 7900HT real-time polymerase chain reaction system in a 384-well optical reaction plate. Each reaction contained 10 μl of 2× Gene Expression Master Mix, 5 μl of nuclease-free water, 1 μl of 20× Primer and Probe mix, and 4 μl of cDNA. All reactions were run in duplicate using default cycling parameters. A commercially available panel of endogenous control genes from Applied Biosystems was run initially and showed that both 18S and β2-microglobulin levels were unaltered at all IL-6 concentrations. Kd values for E. coli-expressed and HEK293-expressed IL-6 binding to IL-6R were determined using a kinetic exclusion assay (KinExA; Sapidyne Instruments, Boise, ID). In brief, a goat polyclonal antibody to IL-6 (25 μg/1-ml beads) was conjugated to NHS-activated Sepharose for 4 h at room temperature and then blocked with bovine serum albumin for an additional 2 h at room temperature. A mouse monoclonal antibody directed toward IL-6 (2 μg/ml) along with a Cy5-labeled goat anti-mouse IgG (1 μg/ml) were used for detection. A constant IL-6 concentration (0.2, 1, or 5 μM) was incubated with increasing concentrations of soluble IL-6R protein (12 concentrations, 3 pM–529 nM) at room temperature for 24 h in phosphate-buffered saline buffer containing 0.5 mg/ml bovine serum albumin. Samples were run in triplicate using the standard Kd method outlined in the KinExA manual and analyzed using the KinExA n-curve analysis software (Sapidyne Instruments). Mass spectrometry data were analyzed using Analyst (Applied Biosystems) and Excel (Microsoft, Redmond, WA). mRNA data were analyzed using SDS 2.3 RQ Manager software from Applied Biosystems with β2-microglobulin as the endogenous control and untreated cells (depending on treatment) as the calibrator. Dose-response curves, EC50, Emax, and Emin values were obtained using GraphPad Prism (GraphPad Software Inc., San Diego, CA) using the log(inhibitor) versus dose, variable slope model (Y = Emin + (Emax − Emin)/(1 + 10[(logEC50−X) · Hill slope] or the bell-shaped dose response model [Y = Emax_plateau + [(Emax_plateau − Emax)/(1 + 10[(logEC50 1−X) · Hill slope 1)])] + [(Emin − Emax_plateau)/(1 + 10[X−logEC50 2) · Hill slope 2)])]. Kd values for IL-6 binding to its receptor were calculated using KinExA n-curve analysis software. Effects of IL-6 Treatment on the Expression of Acute-Phase Response Proteins. Primary hepatocytes from donor Hu1153 were exposed to IL-6 for 72 h. Over the concentration range of 5 pg/ml to 50 ng/ml IL-6, microscopic examination and an ATP assay showed that IL-6 was not toxic to hepatocytes from this donor (data not shown). IL-6 caused a marked increase in the acute-phase proteins, C-reactive protein (CRP) and serum amyloid A (SAA) (Table 1; Fig. 1). The EC50 for CRP induction by IL-6 was 73.4 pg/ml with a maximal fold increase of 1021 over untreated cells (Table 1). SAA induction had a maximal fold induction of 19.9 and an EC50 of 22.9 pg/ml (Table 1). Donor Hu1153 was exposed to IL-6 for 72 h.
Induction of C-reactive protein and serum amyloid A levels in human hepatocytes treated with IL-6. Hepatocytes from donor Hu1153 were treated with IL-6 concentrations ranging from 5 pg/ml to 50 ng/ml for 72 h with daily media changes and IL-6 replenishment. mRNA was isolated, transcribed into cDNA, and analyzed using real-time polymerase chain reaction as described under Materials and Methods. Data were fit to a variable slope dose-response model, and error bars represent the S.D. of three individual wells. A, C-reactive protein. B, serum amyloid A.
Time-Dependent Effects of IL-6 on CYP1A2 and CYP3A4 Activity. Primary hepatocytes from donor Hu1153 were exposed to IL-6 for 48, 72, or 96 h, at which point acetaminophen (CYP1A2 activity) and 6β-hydroxytestosterone (CYP3A4 activity) formation were assessed. At all three time points, both acetaminophen and 6β-hydroxytestosterone formation decreased with increasing concentrations of IL-6 (Fig. 2). After 48 h, maximal suppression of acetaminophen formation was observed with an Emin of 10.7% of untreated cells and an EC50 value of 409 pg/ml (Table 2). Maximal suppression of 6β-hydroxytestosterone formation occurred at 96 h with an Emin of 21.5% and an EC50 of 17.1 pg/ml, although the 72- and 96-h time points were similar. The 72-h treatment duration was chosen to standardize conditions for further investigation. Time-dependent suppression of CYP1A2 and CYP3A4 activity in human hepatocytes treated with IL-6. Hepatocytes from donor Hu1153 were treated with IL-6 concentrations ranging from 5 pg/ml to 50 ng/ml for 48, 72, and 96 h with daily media changes and IL-6 replenishment. At the allotted time point, cells were incubated with either 100 μM phenacetin (A) or 150 μM testosterone (B) for 15 min. Metabolites were analyzed by LC-MS/MS as described under Materials and Methods. Data were normalized to untreated cells and fit to a variable slope dose-response model, and error bars represent the S.D. of three individual wells. Donor Hu1153 was used in this study. Data were normalized to untreated values. Effect of IL-6 on mRNA Expression of Cytochrome P450 Isoforms and IL-6R. mRNA levels were assessed in donor Hu1153 hepatocytes exposed to IL-6 for 72 h. IL-6 caused a global down-regulation of all cytochrome P450 isoforms examined. The EC50 and Emin data indicated that the potency and extent of suppression varied among the cytochrome P450 isoforms (Table 3). CYP1A1 was the least sensitive to suppression by IL-6, with an EC50 of 1620 pg/ml, whereas CYP3A4 was the most sensitive with an EC50 of 3.2 pg/ml. Although many P450 isoforms, such as CYP2B6, CYP2C8, CYP3A4, and CYP3A5, were down-regulated to less than 5% of untreated cells, other isoforms such as CYP1A1, CYP1A2, CYP2C19, and CYP2D6 had a maximal suppression (Emin) of between 15 and 40% of untreated cells. The EC50 for down-regulation of IL-6R mRNA was similar at 107 pg/ml (data not shown), showing that cells respond in a dynamic way to sustained stimulation by IL-6. Donor Hu1153 was treated with IL-6 for 72 h. Data were normalized to untreated values. Donor Variability in the Effects of IL-6 on CYP1A2 and CYP3A4 Activity. To understand variability in the effect of IL-6 suppression on marker assays for two representative cytochrome P450 isoforms, three cryopreserved donors (Hu1001, Hu8064, and Hu4151) and two additional fresh donors (Hu1146 and Hu1150) were assessed. Donor characteristics can be found in Supplemental Table 1. As shown in Table 4 and Supplemental Fig. 1, all donors had decreasing formation of both acetaminophen and 6β-hydroxytestosterone with increasing IL-6 concentrations. The EC50 range for acetaminophen formation was 142 to 4070 and for 6β-hydroxytestosterone formation was 4.2 to 176 pg/ml. Maximal suppression for CYP1A2 activity ranged from 9.3 to 52.9% of untreated cells, and for CYP3A4 activity the range was 10.7 to 41.7% of untreated cells. All donors were treated for 72 h with IL-6, whereas donor Hu4151 was treated with and without a fixed amount of inducer at each concentration of IL-6. Data were normalized to untreated values. Donors Hu1001, 4151, and 8064 are cryopreserved hepatocytes and Hu1146 and 1150 are fresh hepatocytes. Effects of IL-6 on the Induction of CYP1A2 and CYP3A4. To examine IL-6-mediated suppression of CYP1A2 and CYP3A4 activity at different expression levels of cytochrome P450, hepatocytes from donor Hu4151 were treated for 72 h with IL-6 in the presence or absence of the CYP1A2 inducer omeprazole (50 μM) or CYP3A4 inducer rifampicin (10 μM). 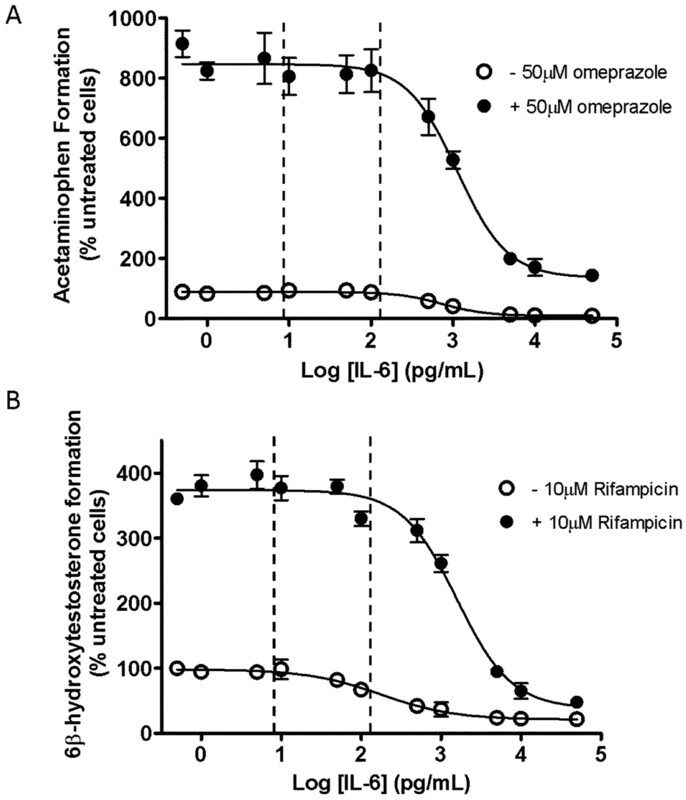 Figure 3 shows that in the absence of IL-6, 8- and 4-fold induction occurred in omeprazole- and rifampicin-treated cells, respectively. 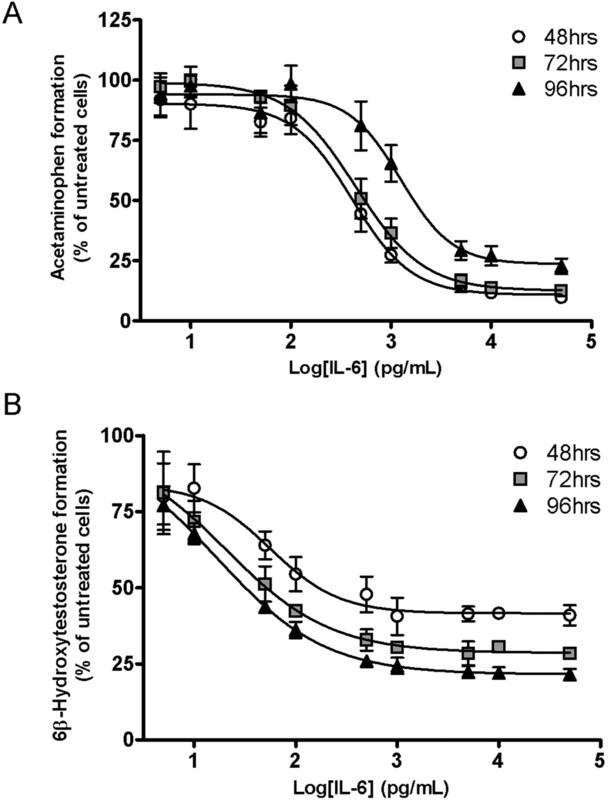 IL-6 overcame the effects of both inducers, but only at concentrations greater than 500 pg/ml. The EC50 of suppression of both CYP1A2 and CYP3A4 activity was shifted in the presence of inducer from 730 to 1120 pg/ml (1.5-fold) for CYP1A2 and from 82.8 to 1574 pg/ml (19-fold) for CYP3A4 (Table 4). The dynamic range of suppression by IL-6 was also affected in induced cells, with Emin increasing almost 15-fold for CYP1A2 activity and 2-fold for CYP3A4 activity. IL-6-mediated suppression of the induced cytochrome P450 isoforms occurred at IL-6 concentrations that were well above those normally encountered in serum from patients with inflammatory disease (2.6–123 pg/ml) (Hidaka et al., 2001; Yilmaz et al., 2001; Arican et al., 2005; Ataseven et al., 2006; Wang et al., 2008). Based on these in vitro data, suppression of cytochrome P450 activity by IL-6 does not override cytochrome P450 induction at physiological concentrations of IL-6. Effects of inducers on CYP1A2 and CYP3A4 suppression by IL-6. Hepatocytes from donor Hu4151 were incubated with increasing amounts of IL-6 with or without 50 μM omeprazole (A) or 10 μM rifampicin (B) with daily media changes and IL-6 and inducer replenishment. After 72 h of treatment, cells were incubated with either 100 μM phenacetin (A) or 150 μM testosterone (B) for 15 min. Metabolites were analyzed by LC-MS/MS as described under Materials and Methods. Data were normalized to untreated cells and fit to a variable slope dose-response model, and error bars represent the S.D. of three individual wells. The dashed vertical lines represent approximate physiological serum ranges (10–125 pg/ml) in healthy individuals and those presenting with chronic inflammatory disease. See text for references. Effect of IL-6 Glycosylation Status on Cytochrome P450 Suppression. Because most commercial IL-6 is expressed in an E. coli system that lacks the capability to glycosylate proteins, IL-6 expressed in a human cell line, HEK293, was used to compare the extent of cytochrome P450 suppression between nonglycosylated and glycosylated versions of IL-6. 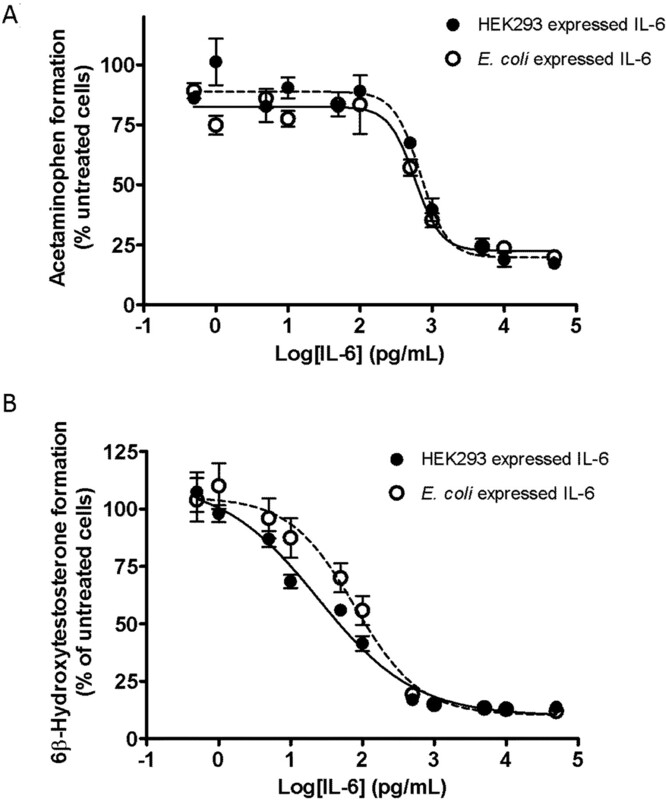 IL-6 expressed in the HEK293 cell line had an observed molecular mass between 26 and 30 kDa and had variable glycosylation (manufacturer's data). Glycosylated and nonglycosylated versions of IL-6 were examined using a kinetic exclusion assay (KinExA) to measure the dissociation constant (Kd) from the soluble IL-6 receptor. The measured Kd for the nonglycosylated E. coli-expressed IL-6 was 5.1 nM (2.5–9.7 nM; 95% confidence interval) and was 3.2 nM (1.9–5.1 nM; 95% confidence interval) for HEK293-expressed IL-6. Figure 4 and Table 5 data from donor Hu1190 show that the glycosylation state of IL-6 did not markedly change the EC50 or Emin data for suppression of CYP1A2 or CYP3A4 activity. Cytochrome P450 mRNA data for several cytochrome P450 isoforms gave similar results (Table 5). Of these isoforms, no statistically significant change in EC50 values was observed between glycosylated and nonglycosylated IL-6. There was also no statistically significant difference in the maximal extent of suppression (Emin; data not shown). Comparison of glycosylated versus nonglycosylated IL-6 on the ability to down-regulate CYP1A2 and CYP3A4 activity. Hepatocytes from donor Hu1190 were treated with either E. coli-expressed IL-6 (nonglycosylated) or HEK293 (glycosylated)-expressed IL-6 for 72 h with daily media changes and IL-6 replenishment. Cells were incubated with either 100 μM phenacetin (A) or 150 μM testosterone (B) for 15 min. Metabolites were analyzed by LC-MS/MS as described under Materials and Methods. Data were normalized to untreated cells and fit to a variable slope dose-response model, and error bars represent the S.D. of three individual wells. Donor Hu1190 was treated with IL-6 for 72 h. Data were normalized to untreated values. P values were calculated using a two-tailed, unpaired t test. Desuppression of Cytochrome P450 In Vitro: Effect of an IL-6 Neutralizing Antibody on IL-6-Mediated Suppression of CYP1A2 and CYP3A4. To assess whether cytochrome P450 suppression by IL-6 can be blocked by a monoclonal antibody against nonglycosylated IL-6, 100 ng/ml IL-6-neutralizing monoclonal antibody was added to hepatocytes in the presence of increasing concentrations of IL-6. To better understand the ability of this particular antibody to neutralize IL-6 activity and cause cytochrome P450 desuppression, a dissociation constant was measured between nonglycosylated IL-6 and the monoclonal antibody. The Kd value was 1.7 nM, similar to the Kd value of IL-6 binding to IL-6R. In two donors, the antibody blocked IL-6 suppression of CYP1A2 activity completely such that an EC50 value could not be calculated for hepatocytes treated with both IL-6 and the anti-IL-6 antibody (Fig. 5; Table 6). In donor Hu1242, CYP1A2 activity data in the absence of antibody was best-fit to a bell-shaped dose-response model with CYP1A2 activity initially increasing between 10 and 1000 pg/ml IL-6 and then decreasing to an Emin of 20%. In the presence of antibody, this effect was right-shifted with an increase in CYP1A2 activity of 171% of untreated cells at 1000 pg/ml and a subsequent decrease to 128% at 10 ng/ml. Effects of an anti-IL-6 monoclonal antibody (mAb) on IL-6-mediated suppression of CYP1A2 and CYP3A4. Hepatocytes from donor Hu8110 (A and B) and donor Hu1242 (C and D) were treated with either IL-6 (0.5–10,000 pg/ml; 2.5 × 10−5–0.49 nM) alone or in combination with 100 ng/ml (0.67 nM) of anti-IL-6 antibody (measured Kd = 1.7 nM) for 72 h with daily media changes and replenishment of IL-6 and antibody. Cells were incubated with either 100 μM phenacetin (A and C) or 150 μM testosterone (B and D) for 15 min. Metabolites were analyzed by LC-MS/MS as described under Materials and Methods. Data were normalized to untreated cells and fit to a variable slope dose-response model, and error bars represent the S.D. of three individual wells. The dashed vertical lines represent approximate physiological serum ranges of IL-6 (10–125 pg/ml) in healthy individuals and those presenting with chronic inflammatory disease. See text for references. Hepatocytes were treated for 72 h with IL-6 in the presence or absence of 100 ng/ml of IL-6-neutralizing antibody. The measured Kd value of the monoclonal antibody was 1.7 nM. Treatment with the IL-6 antibody did not completely abolish CYP3A4 suppression by IL-6 but did shift the EC50 curve 19-fold from 92.5 to 1738 pg/ml in donor Hu1242 and 13-fold from 63.6 to 849 pg/ml in donor Hu8110 (Fig. 5; Table 6). The maximal level of suppression was not markedly altered by the IL-6 antibody at the highest IL-6 concentrations. Human hepatocyte culture is the in vitro system of choice to study the regulation of cytochrome P450 enzymes and transporters by various proinflammatory mediators (Aitken and Morgan, 2007; Lee et al., 2009; Vee et al., 2009). This model has also been used as a model to investigate cell signaling by NF-κB, p38, c-Jun NH2-terminal kinase, leukemia inhibitory factor/lymphocyte activating factor, C/EBP, and other proteins involved in cytokine signaling (Henklova et al., 2008; Vrzal et al., 2008; Wanninger et al., 2009). IL-6-dependent up-regulation of the acute-phase response markers, C-reactive protein and serum amyloid A, is dependent on signaling through the Janus tyrosine kinase/ signal transducer and activator of transcription 3 (STAT3) pathway with involvement of NF-κB subunits p50 and p65 (Zhang et al., 1996; Jensen and Whitehead, 1998), and there is also a complex synergistic interaction between STAT3 and C/EBP that activates transcription of C-reactive protein. Therefore, the ability of IL-6 to cause a dose-dependent increase in both C-reactive protein and serum amyloid A in our study is indicative of an acute-phase response and is consistent with previous reports indicating that our human hepatocyte culture conditions were suitable for studying IL-6 signaling. Under the standardized conditions established to monitor the effects of IL-6 on hepatocytes, dexamethasone was not added to the culture medium, because it complicates the hepatocyte model. Dexamethasone acts as a potent anti-inflammatory agent by controlling levels of leukotrienes and prostaglandins and enhancing cytochrome P450 levels (Pascussi et al., 2000a,b; Brunton, 2011). It also up-regulates the levels of IL-6 receptor on certain cell types (Snyers et al., 1990; Hoffmann et al., 1994) and enhances the effects of cytokines (Steel and Whitehead, 1994; Thorn and Whitehead, 2002). In a pilot experiment, the addition of 100 nM dexamethasone increased IL-6R mRNA by 3.5-fold and CYP3A4 mRNA by 5-fold (Supplemental Fig. 2). These increases are within the natural variation seen in donor populations. In this study, the absence of dexamethasone in the cell culture medium did not substantially alter basal cell stress levels, which was shown by similar ATP and GSH production at IL-6 concentrations up to 500 ng/ml. The mRNA levels of ER stress markers, CHOP and BIP, were slightly higher in IL-6-naive, dexamethasone-treated cells (Supplemental Fig. 2). Effects of IL-6 on Cytochromes P450. This study expands on previous studies exploring IL-6 regulation of cytochrome P450 enzymes in human hepatocyte culture (Aitken and Morgan, 2007; Lee et al., 2009; Yang et al., 2010). In part because of regulatory interest, dissecting out the components of the APR is of industrial interest, because companies working on an anticytokine drug want to know whether their cytokine alone elicits this effect on cytochromes P450. Thus, our approach to reconstituting the APR in this model is cytokine-centric and differs from more complicated disease-specific/multicytokine (i.e., bacterial lipopolysaccharide) approaches. We focused on several key aspects that have not been previously reported: 1) the use of physiologically relevant IL-6 concentrations; 2) biochemical characterization of commercial protein reagents; and 3) the ability of an anti-IL-6 monoclonal antibody to block the effects of IL-6 on cytochromes P450. Our data were comparable to results published previously in that cytochromes P450 were generally down-regulated by treatment with IL-6, although direct comparisons among studies are problematic because of different commercial sources of cytokines and cytokine concentrations. CYP3A4 was chosen as a marker for four reasons: 1) it is the enzyme responsible for metabolizing the majority of marketed drugs; 2) mRNA data indicated that it was the most sensitive isoform to IL-6 challenge; 3) it is the responsible enzyme in the 1.8-fold tocilizumab-simvastatin clinical drug interaction; and 4) it is a PXR-regulated cytochrome P450 isoform. CYP1A2 was chosen as a secondary marker because of its regulation, through the aryl hydrocarbon receptor and not the PXR or CAR receptor (Ortiz de Montellano, 2005). Although individual EC50 values among the cryopreserved donors had greater variability than fresh donors, the average EC50 values between cryopreserved and fresh hepatocytes were not significantly different, suggesting that they are both appropriate for investigating cytochrome P450 regulation by IL-6. To address the role of basal expression of CYP3A4 in IL-6-mediated CYP3A4 expression, we examined suppression of CYP3A4 activity by IL-6 in hepatocytes induced by rifampicin. The EC50 for suppression of CYP3A4 activity by IL-6 was shifted by rifampicin from 82.8 to 1574 pg/ml (19-fold) (Table 4). Based on normal ranges for IL-6 concentrations in serum, suppression of cytochrome P450 activity by IL-6 only overrode cytochrome P450 induction at supraphysiological concentrations of IL-6. Treatment of human hepatocytes with IL-6 generally caused pan-suppression of mRNA for all cytochrome P450 isoforms with EC50 and Emin values varying among cytochrome P450 isoforms and for the same isoform among donors. IL-6 itself was not measured in the media, which precludes adjustment for possible substrate depletion. However, the EC50 data did define differences in responsiveness of individual cytochrome P450s at identical IL-6 concentrations and enabled rank ordering of cytochrome P450 sensitivity to IL-6. PXR/CAR-regulated isoforms CYP3A4 and CYP2B6 were the most sensitive to down-regulation by IL-6, whereas aryl hydrocarbon receptor-regulated isoforms CYP1A1 and CYP1A2 were the least sensitive. Given the EC50 values of suppression for the individual cytochrome P450 isoforms and the physiological serum concentrations of IL-6, we speculate that CYP1A2 levels will not be altered significantly by anticytokine treatments for inflammatory disease. Because IL-6 is differentially glycosylated in vivo, we investigated the effect of IL-6 glycosylation on cytochrome P450 suppression in human hepatocytes. EC50 values for CYP1A2 and CYP3A4 activity showed that the glycosylation status of IL-6 did not markedly alter the potency of cytochrome P450 suppression. These data are in agreement with the Kd values for IL-6 binding to its soluble receptor. The Kd values of glycosylated and nonglycosylated forms were within 2-fold of one another. These data indicate that once bound both the glycosylated and nonglycosylated forms of IL-6 dissociate from the IL-6 receptor with equal potency. An anti-IL-6 antibody was able to block IL-6 suppression of CYP1A2 activity in two donors such that an EC50 value could not be calculated. At supratherapeutic concentrations (500–10,000 pg/ml), IL-6 anomalously increased CYP1A2 activity relative to the initial conditions. The mechanism behind this observation is currently not understood. Treatment with the anti-IL-6 antibody did not completely abolish CYP3A4 suppression by IL-6 but did shift the EC50 curve 19- and 13-fold in two different donors, respectively. The dissociation constant for the antibody used in this study was 1.7 nM, which is similar to the measured Kd values between IL-6 and its receptor (3.2–5.1 nM). However, the Kd value for the IL-6/IL-6R/gp130 complex, the active complex for IL-6 signaling, has been measured at 50 pM (Hibi et al., 1990). This could explain why CYP3A4 suppression was only partially blocked by the antibody used in this study and highlights the importance of biochemical characterization of large molecule reagents for proper interpretation of results. Limitations to the Hepatocyte Culture Model. Cytokines are known to work in consort in an autocrine/paracrine fashion. Several complicating factors in studying cytochrome P450 suppression by cytokines in hepatocyte culture are the lack of other cytokine-responsive cell types normally found in the liver, such as Kupffer cells, the absence of other cytokines that may work in consort with IL-6, a limited time frame to examine adaptive responses, and multiple hepatic functions of cytokines that signal through STAT3 (Taub, 2004; Ki et al., 2010). Because Kupffer cells secrete IL-6 and constitutively express IL-6R, one could envisage that hepatocyte coculture with Kupffer cells would give a different EC50 for cytochrome P450 suppression by IL-6. However, in a study by Sunman et al. (2004), the addition of Kupffer cells to hepatocyte culture did not affect CYP3A4 suppression by IL-6 or IL-1, suggesting that coculture may not be necessary for investigating cytochrome P450 suppression by IL-1 or IL-6 alone. We demonstrated that IL-6 down-regulates its own receptor in human hepatocyte culture, suggesting a potential adaptive response mechanism. Cultured hepatocytes are viable for a relatively short time period and therefore may not be the best model for discerning adaptive responses to cytokine stimulation. Advanced tissue engineering technologies such as three-dimensional liver culture or the HepatoPac platform might better define the adaptive response of hepatocytes to IL-6 and other cytokines. This study shows that inclusion of IL-6 and an anti-IL-6 monoclonal antibody in human hepatocyte primary culture allows for quantitative measurement of cytochrome P450 suppression and desuppression. However, the experiments also illustrate that these data cannot fully address the complicated biology of the acute-phase response and/or chronic inflammation in human liver. Factors that complicate the predictive value of the experiments are the biology of the individual cytokine, relevant hepatic concentrations of the cytokine, the binding affinities of relevant monoclonal antibodies, the absence of other interacting cytokines and cell types in primary hepatocyte culture, and the nuances of patient and disease-specific aspects of inflammatory disease. We conclude that experimentation with a single cytokine in human hepatocyte primary culture will be useful for hypothesis generation. However, the complicated biology of inflammatory disease treatment precludes quantitative in vitro to in vivo prediction of the clinical effects of anticytokine treatment on the pharmacokinetics of small molecule concomitant medications. Participated in research design: Dickmann, Wienkers, and Slatter. Conducted experiments: Dickmann, Patel, and Rock. Performed data analysis: Dickmann, Patel, and Rock. Wrote or contributed to the writing of the manuscript: Dickmann, Wienkers, and Slatter. We thank Josh Pearson for KinExA expertise. signal transducer and activator of transcription 3. (2007) Gene-specific effects of inflammatory cytokines on cytochrome P450 2C, 2B6 and 3A4 mRNA levels in human hepatocytes. Drug Metab Dispos 35:1687–1693. (1989) Interleukin-6: a key hormone of the acute phase reaction. Dtsch Med Wochenschr 114:1710–1716. (2005) Serum levels of TNF-α, IFN-γ, IL-6, IL-8, IL-12, IL-17, and IL-18 in patients with active psoriasis and correlation with disease severity. Mediators Inflamm 2005:273–279. (2006) The levels of ghrelin, leptin, TNF-α, and IL-6 in liver cirrhosis and hepatocellular carcinoma due to HBV and HDV infection. Mediators Inflamm 2006:78380.
ed (2011) Goodman and Gilman's The Pharmacologic Basis of Therapeutics, 12th ed, McGraw-Hill, New York. (2003) Rapid transcriptional suppression of rat cytochrome P450 genes by endotoxin treatment and its inhibition by curcumin. J Pharmacol Exp Ther 307:1205–1212. (2010) Prescribing Information for Actemra, South San Francisco, CA. (2004) Endotoxin leads to rapid subcellular re-localization of hepatic RXRα: a novel mechanism for reduced hepatic gene expression in inflammation. Nucl Recept 2:4. (2008) SB203580, a pharmacological inhibitor of p38 MAP kinase transduction pathway activates ERK and JNK MAP kinases in primary cultures of human hepatocytes. Eur J Pharmacol 593:16–23. (1990) Molecular cloning and expression of an IL-6 signal transducer, gp130. Cell 63:1149–1157. (2001) Dynamic changes in cytokine levels in serum and synovial fluid following filtration leukocytapheresis therapy in patients with rheumatoid arthritis. J Clin Apher 16:74–81. (1994) Regulation of interleukin-6 receptor expression in rat Kupffer cells: modulation by cytokines, dexamethasone and prostaglandin E2. J Hepatol 21:543–550. (2010) Therapeutic protein-drug interactions and implications for drug development. Clin Pharmacol Ther 87:497–503. (1998) Regulation of serum amyloid A protein expression during the acute-phase response. Biochem J 334 (Pt 3):489–503. (2010) Interleukin-22 treatment ameliorates alcoholic liver injury in a murine model of chronic-binge ethanol feeding: role of signal transducer and activator of transcription 3. Hepatology 52:1291–1300. (2009) Dual mechanisms of CYP3A protein regulation by proinflammatory cytokine stimulation in primary hepatocyte cultures. Drug Metab Dispos 37:865–872. (2005) Cytokine profiles during infliximab monotherapy in psoriatic arthritis. Br J Dermatol 153:531–536. (2001) Regulation of cytochrome P450 by inflammatory mediators: why and how? Drug Metab Dispos 29:207–212.
. (1998) Physiological and pathophysiological regulation of cytochrome P450. Drug Metab Dispos 26:1232–1240. (1988) Recombinant interleukin 6 regulates the transcriptional activation of a set of human acute phase genes. J Biol Chem 263:12554–12558. (2005) Cytochrome P450: Structure, Mechanism, and Biochemistry, Plenum Publishers, New York. (2000a) Dexamethasone induces pregnane X receptor and retinoid X receptor-α expression in human hepatocytes: synergistic increase of CYP3A4 induction by pregnane X receptor activators. Mol Pharmacol 58:361–372. (2000b) Dexamethasone enhances constitutive androstane receptor expression in human hepatocytes: consequences on cytochrome P450 gene regulation. Mol Pharmacol 58:1441–1450. (2000) Hepatic and central nervous system cytochrome P450 are down-regulated during lipopolysaccharide-evoked localized inflammation in brain. J Pharmacol Exp Ther 294:524–530. (2007) The IL-6/sIL-6R complex as a novel target for therapeutic approaches. Expert Opin Ther Targets 11:613–624. (2000) Raised interleukin-6 levels in obese patients. Obes Res 8:673–675. (1994) Endotoxin administration to humans inhibits hepatic cytochrome P450-mediated drug metabolism. J Clin Invest 94:2209–2214. (1990) Glucocorticoid up-regulation of high-affinity interleukin 6 receptors on human epithelial cells. Proc Natl Acad Sci USA 87:2838–2842. (1994) The major acute phase reactants: C-reactive protein, serum amyloid P component and serum amyloid A protein. Immunol Today 15:81–88. (2004) Kupffer cell-mediated IL-2 suppression of CYP3A activity in human hepatocytes. Drug Metab Dispos 32:359–363. (2004) Liver regeneration: from myth to mechanism. Nat Rev Mol Cell Biol 5:836–847. (2002) Differential glucocorticoid enhancement of the cytokine-driven transcriptional activation of the human acute phase serum amyloid A genes, SAA1 and SAA2. J Immunol 169:399–406. (2009) Regulation of drug transporter expression in human hepatocytes exposed to the proinflammatory cytokines tumor necrosis factor-α or interleukin-6. Drug Metab Dispos 37:685–693. (2008) Microtubules-interfering agents restrict aryl hydrocarbon receptor-mediated CYP1A2 induction in primary cultures of human hepatocytes via c-jun-N-terminal kinase and glucocorticoid receptor. Eur J Pharmacol 581:244–254.
. (2010) N-linked glycosylation is essential for the stability but not the signaling function of the interleukin-6 signal transducer glycoprotein 130. J Biol Chem 285:1781–1789. (2008) Circulating cytokine levels compared to pain in patients with fibromyalgia—a prospective longitudinal study over 6 months. J Rheumatol 35:1366–1370.
. (2009) Adiponectin-stimulated CXCL8 release in primary human hepatocytes is regulated by ERK1/ERK2, p38 MAPK, NF-κB, and STAT3 signaling pathways. Am J Physiol Gastrointest Liver Physiol 297:G611–G618. (2010) Pregnane X receptor is required for interleukin-6-mediated down-regulation of cytochrome P450 3A4 in human hepatocytes. Toxicol Lett 197:219–226. (2001) Cytokine levels in serum of patients with juvenile rheumatoid arthritis. Clin Rheumatol 20:30–35. (1996) STAT3 participates in transcriptional activation of the C-reactive protein gene by interleukin-6. J Biol Chem 271:9503–9509.